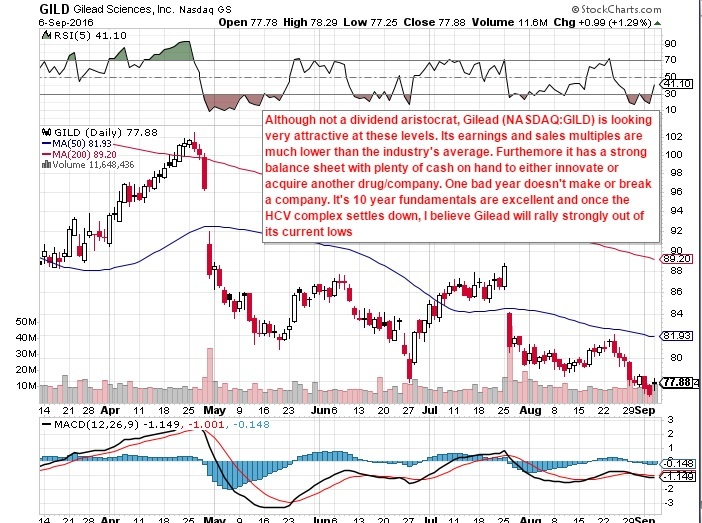 Although not a dividend aristocrat, Gilead (NASDAQ:GILD) is looking very attractive at these levels. Its earnings and sales multiples are much lower than the industry’s average. Furthemore it has a strong balance sheet with plenty of cash on hand to either innovate or acquire another drug/company. One bad year doesn’t make or break a company. It’s 10 year fundamentals are excellent and once the HCV complex settles down, I believe Gilead will rally strongly out of its current lows.